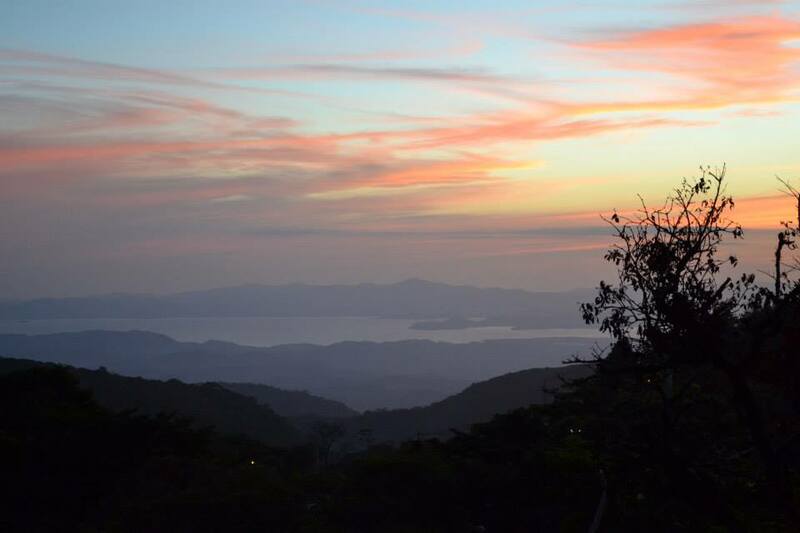 Depending on where you’re coming from, getting to the Monteverde area of Costa Rica is no easy task. We were driving in from La Fortuna, and while the two spots don’t look far apart on a map, they are divided by Lake Arenal and a long stretch of difficult, unpaved roads. We made the mistake of leaving La Fortuna after 5pm, too close to nightfall. We got to Tilarán on the other side of Lake Arenal in about an hour, traveling on reasonably good roads. Then came the unpaved stretch and our speed slowed to 20 km/hr on the bumpy ground. It was tedious and at times rather creepy — streetlights were few and far between and the darkness swallowed everything around us. Occasionally a single motorcycle light would appear in the rear-view mirror, bringing on irrational visions of being overtaken and robbed by a rouge biker hoodlum. There were certainly stretches where we passed no civilization or indication of life, and I imagined what we would do if we were to get a flat tire on a bumpy road in the black middle of Costa Rican nowhere. Bottom line: it’s better to travel the road to Monteverde during the day if you can. Thankfully, neither the robbing nor the flat tire came to pass, and we arrived at our destination, the lovely Hotel Belmar, just before the kitchen closed. Perfect timing. We awoke early the next morning in Santa Elena, the main town in the Monteverde region, well-rested and ready for the day ahead. After a lovely hotel breakfast we headed out to Selvatura for an 8:30am date with the zip lines. It was cool and drizzly – the cloud forest of Monteverde is chillier than other parts of the country – but the zip lining was still great. We did a thirteen-rope course that lasted close to two hours. It was great fun flying above the canopy, experiencing a birds-eye view of the rainforest. The tour offers the option of doing something called “the superman” at the end of the trip, which means getting into an additional strap and zipping face first, as if you’re flying like the Man of Steel. I was too wimpy to try it, although in hindsight I regretted it a little. Danny did it and said it was a blast. If you like a little adventure, book a ziplining tour. Costa Rica is famous for them, and they offer a cool new perspective on the forests. After cleaning ourselves up back at the hotel (you get surprisingly muddy ziplining), we set out for a pizza lunch and a stroll around Santa Elena. Truth be told, there’s not much to see in the three block town, but I did pick up a couple of postcards. That afternoon, after a quick cat nap at the hotel, we embarked on a hike to what was billed as the highest point in Monteverde. The hike certainly was steep, and it left us breathless in parts. On our way we met a friendly Lithuanian man from Wisconsin who joined us on the quest to the summit. He said that the hike was listed in his Lonely Planet book; it was not in our Fodors book. At the top, the wind howled around a seemingly deserted area filled with locked, metal buildings (one of which had music playing inside yet seemed to be locked from the outside) and huge radio towers whose wires whipped repeatedly in the wind. The entire place left us feeling creeped out, and at the end of the day, the view wasn’t much better than the view from our hotel. Good exercise, but I’m not sure I’d heartily recommend the hike. I was not sad to begin the decent (it’s hard on the knees and slippery) and find myself pleasantly seated on the balcony of the Hotel Belmar restaurant, enjoying a similar view and happy hour snacks. For dinner that night we made our way back into Santa Elena to a spot called The Tree House, an open-air restaurant with a giant tree growing in the middle of the place and branches hanging over the table. It’s a very nice atmosphere, and the food is tasty. A word of caution, though: Should you choose to cenar in the open-air part of the restaurant, bring layers. The Monteverde/Santa Elena area is much cooler than other popular tourist spots in Costa Rica, and it gets chilly at night. As soon as we finished we high-tailed it back to the hotel and hopped into bed to warm up. As the wind banged outside, I felt happy and cozy in my hotel refuge. If you are looking for a hotel in the Santa Elena area, I must recommend Hotel Belmar. I loved everything about the place: great rooms, private balconies, organic products, delicious food, beautiful lobby, nice grounds and very friendly staff. It was a wonderful hotel experience. The next morning we got up early for our final Monteverde event: a guided tour in the nearby Monteverde Reserve. The tour began at 7:30am and lasted two and half hours, during which time our guide excitedly told us about the flora and fauna in the area. It seemed as though he had started his day with several espresso shots, as he spoke quickly and passionately and often interrupted himself to point out a bird’s song or begin another thought. The walk was nice, but we saw fewer animals than I’d hoped. We did spot some beautiful jungle birds and a family of white nosed coatis, which was cool. I also caught a glimpse of a tarantula inside his log home. That was close enough, thank you. No need to see another one of those! 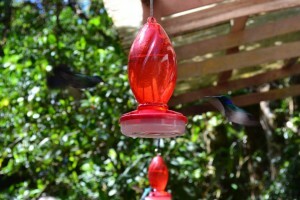 The tour concluded at the humming bird feeders. There were quite a few of the colorful birds buzzing around – very pretty little things. By 10:00am we were headed back to the hotel to pack, ready to trek on to our next destination: the beach.